A tale of two shrugs and other stuff. 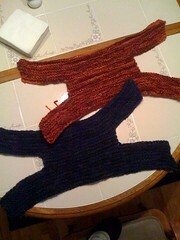 This may be the first time where I have knit the same thing twice (socks excluded). And it wasn’t terrible! 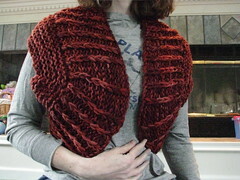 These shrugs, DROPS design #98-47 are quite cozy and warm. I know I have some wool that would be great – I held the yarn doubled and that took 3 skeins of yarn. 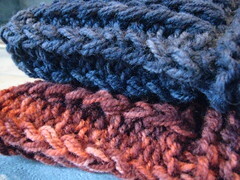 Being sample knits for Romney Ridge Farm, I used their yarn, and the hanks are around 200 – 225 yards each. I think I have rediscovered a love for garter stitch. 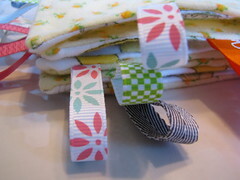 It’s squishy and easy and you have got to love the texture! Even picking up the edging wasn’t too bad. 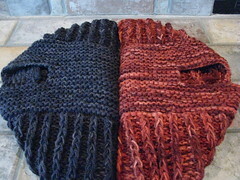 I will say that working for several hours with doubled yarn and US17 needles made my hands ache a bit. Worth it though. When I needed a break from that I have been working on a test knit – Caitlin’s Cardi – for me, in Schaefer Yarn, Miss Priss, Thistle colorway. 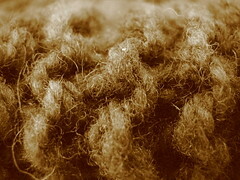 Love one-piece (or, mostly one-piece / minimal seaming) sweaters, but the downside is that there are a lot of stitches. 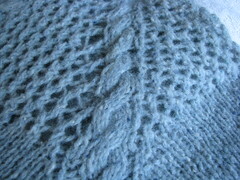 I feel like on the patterned rows it takes me an awful long time to knit across. I’m maybe 7 inches or so up the body – it’s coming. 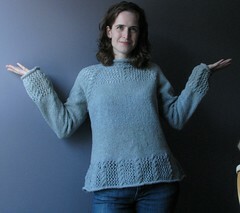 With the shrugs done (deadline knitting) I have a bit more flexibility in my knitting schedule. 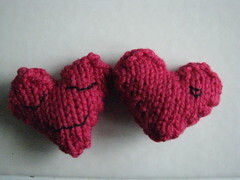 It is nice to have not just one, but two finished objects so quickly. And these are two of my Ravelympics events, though I’ve watched very little of the Olympics. I’ve been feeling a bit “meh” lately – I’m waiting on some leads, watching “Hoarders” and “How Clean is Your House” doesn’t make me feel any better, the weather has been icky, Lorelai has been going through some HUGE developmental milestones that are exhausting to me (she’s talking in near full sentences, with memory recall, and detail, and we’re working on potty training.) 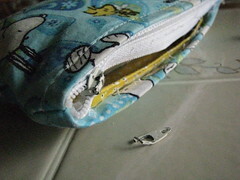 and then my notions bag busted! 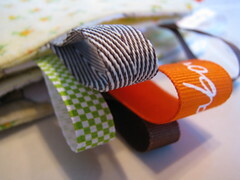 The zipper pull came off the zipper-thingy. I had to cut into the bag to get at my notions (I credit my years on the high school costume crew for my abilities with a seam ripper)! I’m hoping I can salvage the fabric in some way, but I’m not sure. On the plus side, I do have a brand new notions bag. 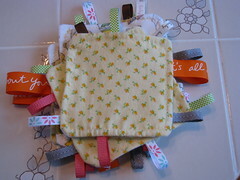 A fellow blogger, Samantha started selling project bags that she made on etsy. 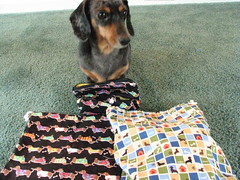 I thought they were great and left her a comment that I would love a dachshund fabric bag – well, she came through and it is fantastic! 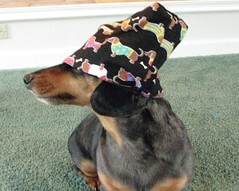 Then she let me know she had more dachshund fabric and would I be interested in it or another style? I said yes right away and we discussed the idea of a notions bag. Perfect timing, who knew? There’s a sweater in progress in the bag on the right, and I’ll be filling up the notions bag ASAP! Once I’m done asking Jackson to model. 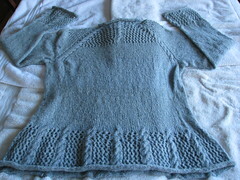 A recent test knit has been completed, yay! I worked on Icing by Samantha Roshak. 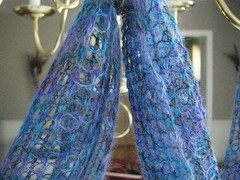 I used Cherry Tree Suri Lace Alpaca, colorway is unknown as I have long lost the band. But it’s pretty and totally my colors, blues-purples-grey. 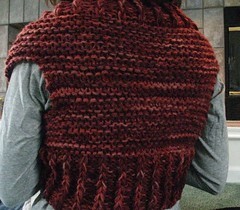 Aside from my bat shawl, this is the first project for which I have actually used lace weight yarn! 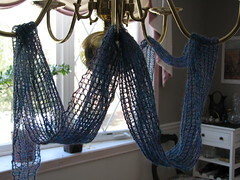 I like the effect of lace in a slightly heavier weight yarn (more like a sock weight) and I think this would be a great project for a special skein of sock yarn as well. 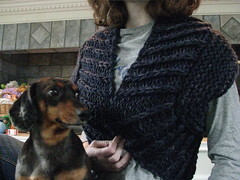 I used roughly half a skein, and in the end it measures about 12″ x 60″ (more on that in a bit). I will say I have had a lot of trouble figuring out how to get a good photo of this particular object. I took a bunch and am going to run with them and if the inspiration fairy strikes later I’ll revise my photos. So for now, I’ll deal with a lot of “That Doesn’t Look Right”. 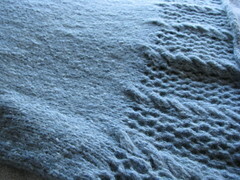 For instance, Jackson as a model, though the photo does show the fuzz factor of the yarn, pre-soak / block. 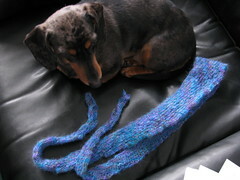 Also pre-block, the scarf was about 3 dachshunds long. 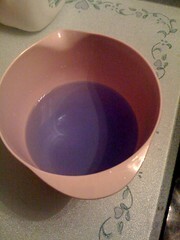 I was surprised to find after soaking the scarf, that the water was blue! I had no indication that would happen – no dye came off on my hand while knitting, and nothing was on the towels after blocking, so really no big deal, but it makes you stop for a moment and go, huh? 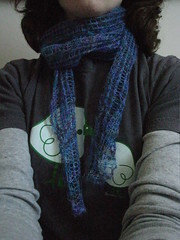 Now that it’s all unpinned it’s deliciously soft and airy and will be a great late winter into spring scarf, I love it. 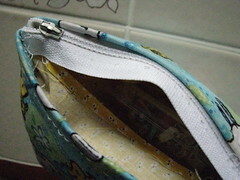 I do worry about catching one of the lace holes on anything, but that’s my clumsy nature. I will try to be careful. Holes in my work, must be lace! I’m just trying to be fancy here. I think the chandelier in my dining room has potential. On a person, wrapped roughly twice around my neck and there is still length for tucking in or whatnot. This is the first time I have busted through a heel. In fairness to the sock it was a different construction (this is bartholomew’s sock from the Cat Bordhi sock book) and I think that may have contributed to some wear and tear. Since I’ve killed 3 pairs of socks in the last year besides this, and all those socks went out at the balls of my feet, not the heel, I’m confident in that assumption. 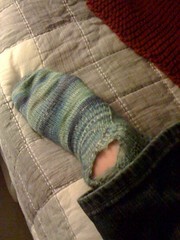 Makes me second guess making more socks in that style of construction. I decided to sign up for the Ravelympics, ambitiously of course, because I don’t know how to do things like that any other way. My plan is “competition” in 4 events – Skelegurumi (have another baby toy to make), WIP Dancing (finish up my Seahorse) and 2 Sweaterboard Crosses. I am working on two shrugs for Romney Ridge Farm – one in a navy / blueberry – purple and one in a variegated cranberry-ish colorway (neither have labels, so I”m not 100% on the colors). 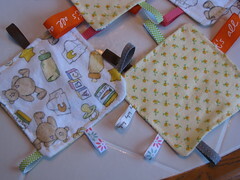 This is my first time working with a DROPS pattern and I find it interesting that the pattern is only a paragraph! 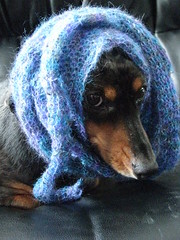 Not a problem if you know how to knit, but it keeps me on my toes – double checking my work. 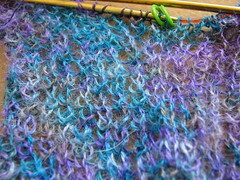 Right now, both bodies are done – they need a slight block and then seaming and picking up stitches for the edging. Each piece looks like a funky chromosome to me. 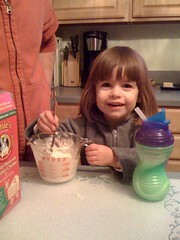 Here’s half of my funky chromosomes – helping to cook some Annies for dinner. Left over sock yarn, held doubled – one made with a face for the Lorax, the other is a sleepy eyed heart with a heart tattoo on its backside, for the hubby. Quick and cute. I have been trying to come up with other ideas for things to do with the Lorax – she’s not really into playing by herself, but if you sit with her she can be content and focused on a project or whatever. I had brought out my button jar and big old box of fuzzy-puff-balls again and I’m getting bored with it (even though it’s wicked cute to hear a little two year old voice say “Daddy? Play buttons and fuzzies?”). Poking around the web I’ve found some new blogs to follow- Totally Tots, Preschool Playbook and No Time For Flashcards are some I’m really enjoying. 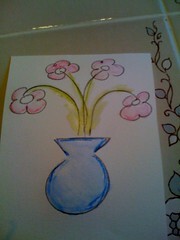 I spotted a post online that reminisced about Paint With Water – did you do those? I know I did, hubby did not. Anyway, painting is one of those crafts I’m a bit hesitant about start with the Lorax – I think she might still be a bit too young (and lets face it, she’s just as content to scribble with crayons or markers), and I don’t want to make a huge mess that I will have to clean up. But those paint-with-water type books might be a great idea. According to the post you can find them at amazon and target (will have to look this week), and dollar stores (keeping my eyes out). Poking around a bit more I found an Inspired Ideas blog post about making your own with watercolor paper, watercolor pencils, and just add water! Brilliant! 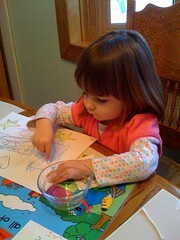 Then she wanted to do some of the coloring part as well, so we went back and forth between coloring and painting. This worked out (for the most part) really well – she was focused on this for 25 minutes and didn’t want to get out of the chair to greet Dan when he came home. My next activity to try with her is going to be a lacing project – I found a pack of lacing beads at the dollar store – will she stick with it or just get frustrated? I also want to try our hands at Fruit Lacing – I think I already have all the materials for that, just need to put them together. I wish everyone gets an extra snuggle or two today, maybe some chocolate and that you take good care of you! I am extremely blessed with my little family – we have kept the celebration simple – balloons for Lorelai (one blue, one yellow that she picked out at the grocery store), I made a heart for Lorelai and Dan, and I received a hand-written-valentine from Dan (we used to exchange letters all through college / grad school when we were apart). Sushi for dinner tonight, yum. Simple and happy. The ends are all woven in. Blocking is done. The pins are removed. I have a new sweater! 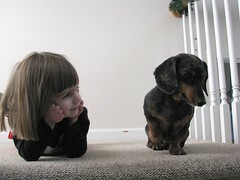 Sometimes I wish there were two of me – one to use the camera and the other I could boss around to pose. I used the self timer on the camera and mostly felt silly – but I liked the plain background of a purple wall in my house. 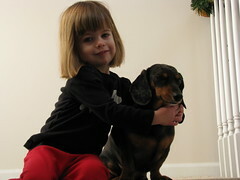 Anyway, this photo was the best of the bunch. I remembered that you should give your model something to hold or do while posing – makes the person relax and you can get better photos. So I grabbed what was nearby. Jackson. He got antsy because he could see out the window and I think our neighbor-dogs started barking. The Lorax. She too was a bit antsy looking out the window at the neighbor-dogs. 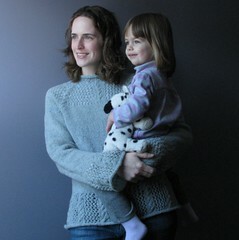 On the whole, I like this sweater – it came out a bit too big, but that’s my own fault – somewhere in the yoke area I started following the instructions for the next size up and once I realized that I just stuck with it. It’s a comfy sweater and warm. I’m pleased. I have always enjoyed a good snow day. These days a snow day is not much of a disruption to my daily routine, or Lorelai’s. But there is something about snow, now matter if it’s a blizzard prediction or just a flurry that makes everyone a little giddy. I say, it’s New England. It’s supposed to snow. 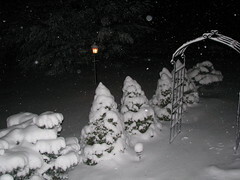 Yes, many of us are getting antsy for spring, but I’m ok with the snow – it’s been cold – and the snow makes it worthwhile. Mostly. Until you go out to shovel like I did this morning and holy chickens I think this would be categorized under “Heart Attack Snow” – it’s heavy – and though it is starting to melt, I had to remove my neckwarmer and jacket while shoveling I got so heated! A snow day seemed like a great idea to give a new project a try. I needed my sewing machine to do something on a different project (knitting related, details / photos of that later) anyway, so I pulled out the machine and fabrics and ribbons and had fun! 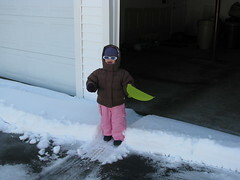 This morning Lorelai and I went out for a bit and did some shoveling. Love how she fits in the tire track. Back to the knitting. I am really hoping to finish up one gift that has been in the wings for EVER, I’ve got “Icing” to continue working on (I’m halfway done – now the decreases start! 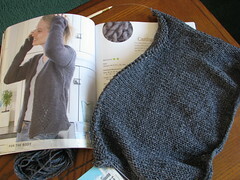 ), 2 samples to start up and a sweater test knit to work on. And Dan’s socks. And the baby gifts 🙂 I like to be busy! I’ve been making progress on many fronts – I am feeling very accomplished! 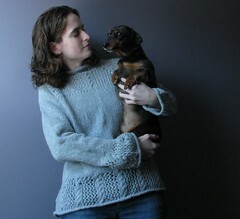 My Trellis & Vine sweater is now blocking. Holy chickens, wool holds on to a lot of water. The weather this week is predicted to stay really cold, so I would love to be able to wear this soon! I think this one uses the crockpot in the slightest way possible – you pop in the chocolate chips and butter to melt, then it is a big enough dish to stir all the pieces together. 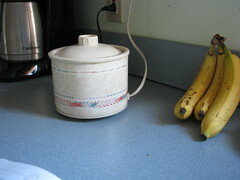 However, I liked not having to worry about the temperature controls on my stovetop – I was able to wash dishes and do some other stuff while it melted away. 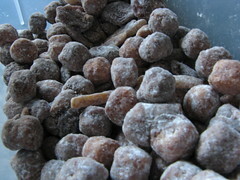 I used Reeses PB Puff cereal (OMG, addictive), and the end result is quite delicious. And addictive. Even my picky husband says so (and I was nervous – he’s not a huge fan of almonds, but the almond slivers don’t seem to bother him too much. I don’t think he noticed them.) One downside to this snack, apart from the addictiveness is that it is tossed with confectioner’s sugar at the end and I find that a lot of that coating sticks to my hands and ends up under my fingernails. This is not a knitting friendly snack. 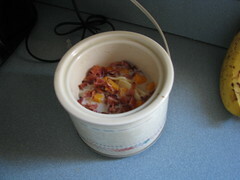 For the Superbowl, I made Bacon and Cheese Dip, also from the crockpot365 cookbook. Lucky for me I snagged a “Little Dipper” crockpot (I think it holds 2 cups) from a family member at a swap a few months / years back. I have no instructions for it, but it works. I wish it were just silver and black, but I’m not going to argue too much on that – free is free. That’s early in the melting stages – we had bacon with breakfast and cooked up the rest of the package to use in the dip, but I’m sure you could use bacon bits too. I didn’t have slices of cheddar cheese, but I had a cheddar cheese stick (good toddler snack) – so I broke one up and used that. You can’t go wrong with bacon and cheese, but this was surprisingly good! Hubby, brother-in-law and my father-in-law all loved the dip! Great with chips, pretzels, etc. Yesterday, since my sweater was blocking I felt the call of my next sweater – I swatched, as directed on US11 and US13 and was just not loving it and not getting gauge. Swatched on US10 I liked the fabric, so I’m doing something totally unlike me when it comes to knitting. 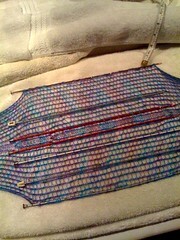 I’m using the gauge I did get, did some math and will knit a different size (the XL) and that *should* work out. I’m nervous but so far so good, though I’ve only done half of the back. I almost always get gauge or close. I don’t deviate from patterns. This is a new knitting path for me. 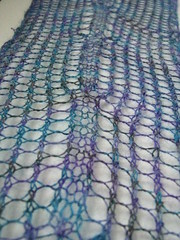 I’m also working on a few test knits – a short sleeve sweater, which looks to be adorable, and a lace wrap – maybe you’ve seen it? Icing – it’s a great pattern so far. 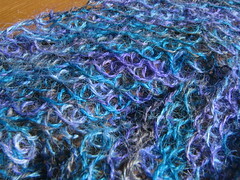 I am using lace, actual lace – which I have only ever done once before in the Bat Shawl. So far it is really coming along, and I am expecting some excellent blocking magic, right now it’s all squooshed up. This yarn has the most vibrant shades of purples and teals and grey – which I love, and it’s a bit fuzzy – which I don’t love. 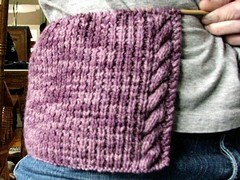 But I do love the backside of the knit – all those loops! I think it slows me down because I keep stopping to admire the loops. And what’s Lorelai up to? Being fabulously herself. 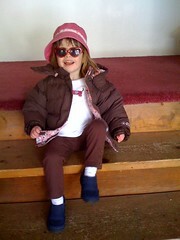 Last Friday, on our way out to do errands, it was FREEZING cold and she wanted to wear her summer bucket hat and heart sunglasses. 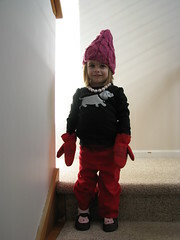 I think she pulls it off. 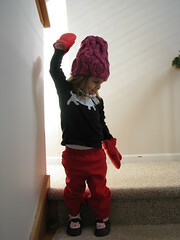 And then today, I came back inside from giving Jackson a bathroom break, and I see she has decided on wearing mittens and my Unoriginal Hat in the house. 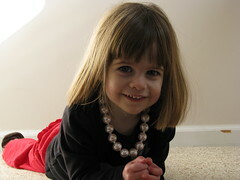 Necklace was her idea too. Luckily she agreed we should take a picture of this.